I always wanted to bring some sunshine on my Thanksgiving dinner table, so this year I decided to decorate the potato salad as a nice, bright sunflower. The kids loved the new flower on the table and everybody wanted to try it. 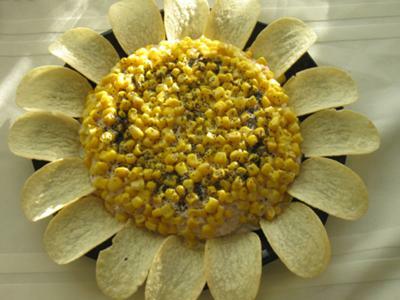 Overturn neatly on a platter and sprinkle the corn and poppy seeds over, then decorate the edge with potato chips. What an added addition to any meal. So original and such a beautiful addition to any table. Never saw a potato salad like this one. It must be delicious.